With enough room to store up to 300 cigars, the spacious interior & the handsome appearance of the Windsor have made it a cigar smokers' favorite. 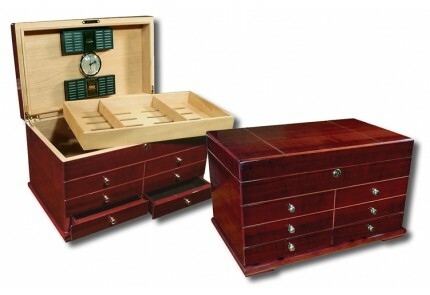 This Windsor is a Deluxe humidor chest in a cherry wood high gloss finish. 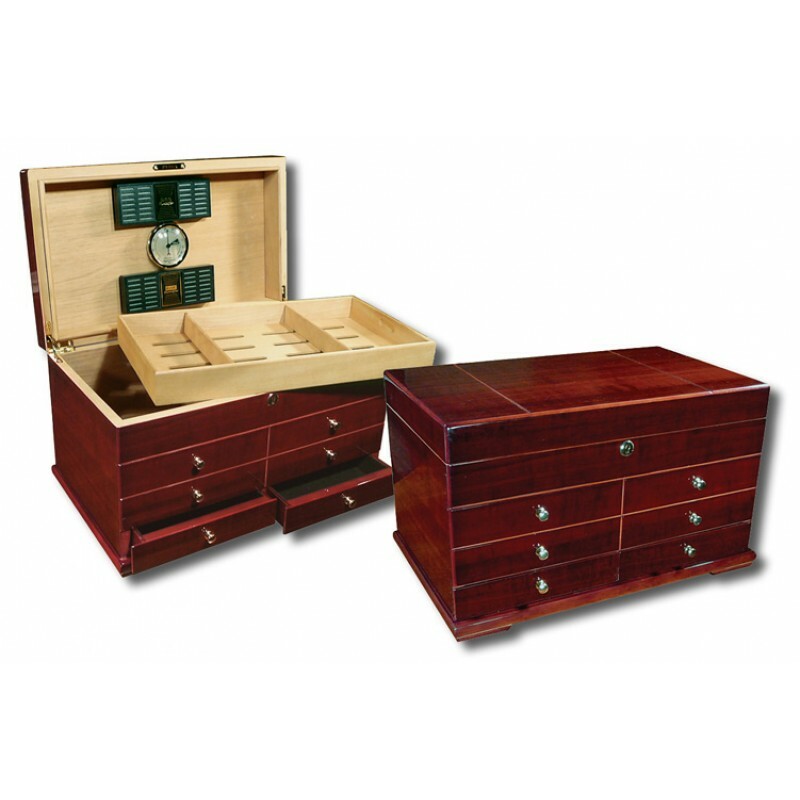 Features two drawers to store your cigar accessories, a gold lock with key & heavy duty internal brass gold locking hinges for additional lid support. The Windsor is equipped with a huge lift-out spanish cedar tray and 2 large humidifiers to insure proper humidity distribution. 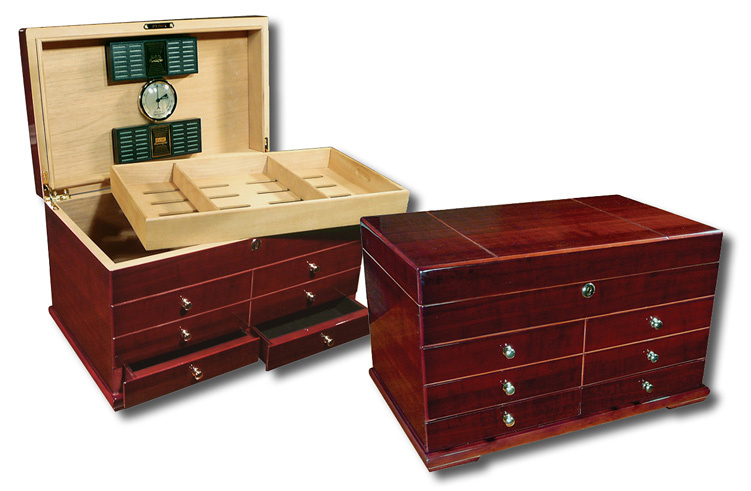 This humidor includes 2 spanish cedar dividers to further section off your cigar collection. Find Humidors like these in your local cigar retail shops for as much as $400+. 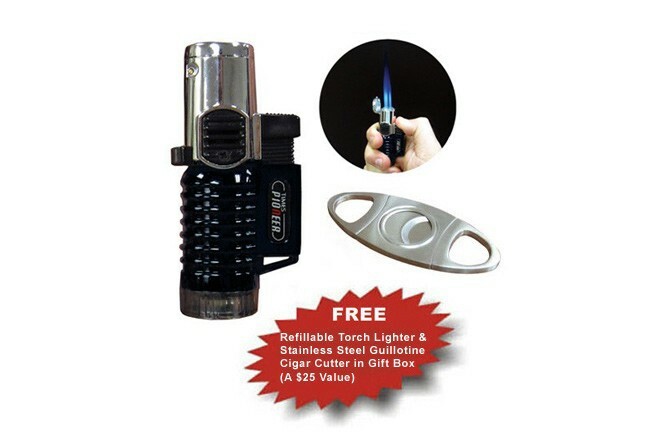 And to make this deal even sweeter, we'll throw in a triple flame torch lighter (color may vary) and a stainless steel guillotine cigar cutter in a gift box FREE! (see images above). These free items can be stored in the Windsor's pull out accessory drawers. Holds Up To 300 Cigars! Seasoning went well holding 68 to 71 % humidity. Very happy with this purchase. This humidor is made very well and everything feels like a quality build. The two drawers on the bottom open and close smoothly without any issues. The lid closes very tight so you can feel confident there are no leaks where you humidity is just running out. This replaced a smaller humidor. Straight out of the box, this thing is beautiful. Good solid construction. Fast FREE shipping. This humidor is advertised on other websites as the "Landmark". In fact, the item number on 1st Class is LNDMK, but it is call the Windsor on here. It is the same thing. What isn't the same is the PRICE! 1st Class is $10-80 cheaper, depending on the site you look at. 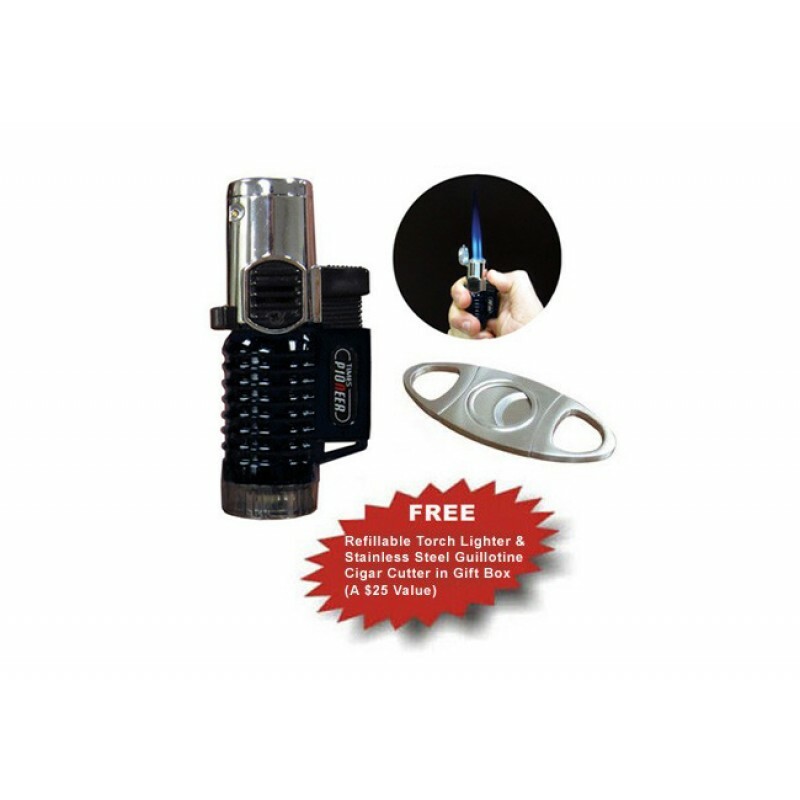 Plus, free shipping, plus a free lighter, plus a free cutter! How could you not buy from this site? I bought one of these about 11 years ago. Just bought another, and it is EXACTLY the same except for a very minor difference in darkness. Excellent humidor and has very good seal. I bought this humidor to replace my smaller 150 cigar humidor. As my collection grew so did the size of my humidor. First off the shipping time was great. I received the humidor realitivily quick. The build of the box is really good and has a great seal. The humidity is constant which makes me happy. My old humidor humidity fluctuated throughout the day which drove me nuts. Anyway if your looking for a good price on a large humidor try this one out, you won't be disappointed. As for their customer service they did an amazing job! When the humidor arrived I noticed that I only had one humidifier. The description says there will be two that come in the box. So a quick email and two days later I had the second one sent to me. I shopped around at some local cigar shops. Their small humidors (50 sticks) were more expensive that this one that holds 5-6 times that. It's nice looking and now that it's been seasoned, it's working like a champ. This humidor is actually even nicer looking in person than in the pictures. It has a high gloss and feels nice. It's fairly large but doesn't "look" like it could hold 300 cigars, until you start actually putting them inside. I dumped all my cigars from a 2/3 full 125ct humidor into this one and it barely formed one layer of cigars on the bottom and in the tray. The seal is really good as well, I put beads in it, brought it up to 70% with nothing in it, then pulled the beads out and left it closed for 24 hours with no humidification in it and when I opened it again 24 hours later it was still at 70% inside. a guy on my cigar forum posted a link to this humidor, asking if it was a good price. It was such a GREAT price, I bought one myself! Holds humidity great, and looks great. Thanks Review by Russell C.
Want to thank you. You were prompt and every thing including the Windsor was exactly as advertised. I will be referring you to my cigar smoking friends.